This hilarious romantic musical comedy is a fun look at a topic not often discussed in the movie world. Led by Anna Kendrick, this movie keeps you interested from beginning to end. Pitch Perfect starts out at the national college a cappella competition where the Barden Bellas are performing. The group performs well until Aubrey Posen projectile vomits. Flash forward to next year, Beca (Anna Kendrick) is a freshman who eventually joins the group. She meets movie nerd Jesse (Skyler Astin) as they work at the radio station together. Part of the magic of this movie is the use of many different decades of music. Every singer is impressive and holds their own weight. Anna Kendrick in particular is really brilliant, both singing and acting wise. Despite the fact that Kendrick is great as a leading character, it’s the supporting characters that really complete the story. The ensemble cast and their comedic timing proves how hilarious and talented these actors and actresses are. The film was directed by Jason Moore who made his film directorial debut here. He previously had experience directing on Broadway and off-Broadway. With that being said, I think he was definitely a good choice due to the musical nature of this film. There isn’t all that much to go off here since movies like this one depend more on the script and actors than decisions made by the director. Overall, he did a solid job for his time directing on the big screen. 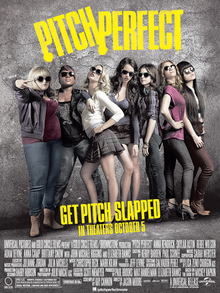 As a whole, Pitch Perfect is a movie that never gets old. It’s filled with hilarious one liners and has an incredible ensemble cast. It balances comedy, romance, and musical in a way that works and isn’t too much. There’s a reason why this movie is going to have a sequal. It’s generated quite the following and it’s not too difficult to see why.